1Department of Pharmacognosy and Pharmaceutical Sciences Research Center, School of Pharmacy, Shiraz University of Medical Sciences, P.O. Box 71345–1583, Shiraz, Iran. 3H.E.J. Research Institute of Chemistry, International Center for Chemical and Biological Sciences, University of Karachi, Karachi, 75270, Pakistan. 4National Center for Natural Products Research, Research Institute of Pharmaceutical Sciences, University of Mississippi, University, MS 38677, USA. Iris species are rich sources of isoflavonids among monocotyledons. Several secondary metabolites of plants origin posses' estrogenic effects, collective known as phytoestrogens. Soy supplements are the well known products including phytostrogenic compounds such as genistein and daidzein . However, phytoestorgenic activity of Iris genus has not been reported so far. The rhizomes and roots of I. songarica Shrenck were extracted by maceration with EtOH. The extract was chromatographed on silica gel column. Final purification was carried out by repeated column chromatography and recycling preparative HPLC to obtain compound 1–5. The assay was performed on 96-well plates as previously described . Yeast cells (Saccharomycess cerevisiae, expressing the human estrogen receptor alfa) was used for biological assay. 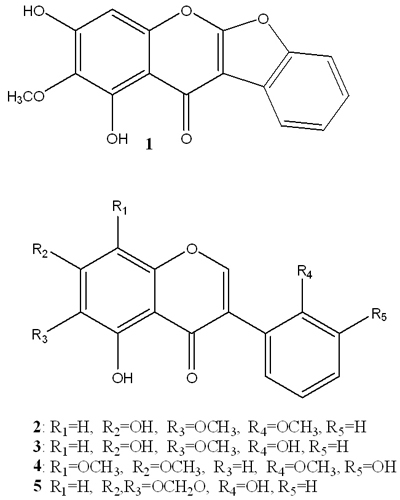 17 β-Estardiol and Chlrolphenol red β-D-galactopyranoside were used as positive control and indicator, respectively. The absorbance was measured at 540nm. Dose curve were generated by plotting absorbance against concentration. We identified that hydroxylation at position 2′ induced esterogenic effect in isoflavone (%Maximum estradiol response 1: 37.3 2: Not active, 3: 21.2, 4: Not active, 5: 11.2). Also, methylenedioxy group attached to C6 and C7 exhibited a more potent esterogenic activity. It might be possible that 2′- hydroxylation substitution has important role in producing of esterogenic prosperities. References: 1. Vaya, J., Tamir, S. (2004) Curr Med Chem. 11: 1333–1343.